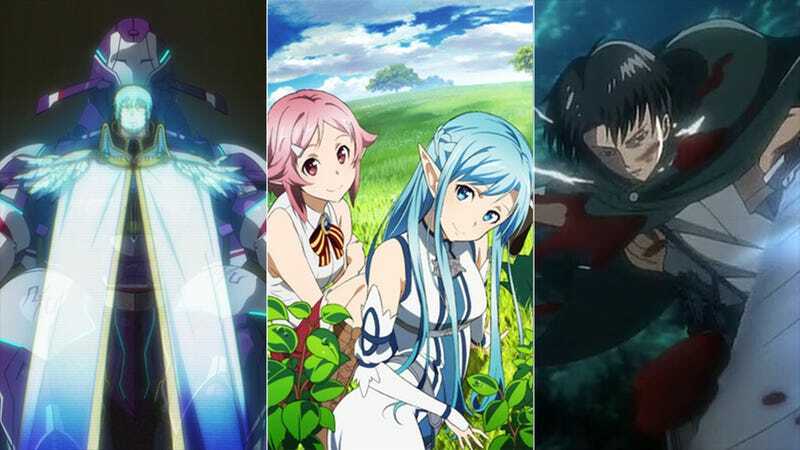 There are a lot of good anime out there this year, but sadly, when they’re over, they’re over—or are they? These days, more and more series are getting extra, not-aired-on-TV OVA episodes that often don’t show up on legal anime streaming sites. So, let’s take a quick look at some of these “missing episodes” that have come out over the past year. What It’s About: Ilse’s Journal is a prequel episode to the anime that follows Ilse, a young survey corps member and only survivor of a Titan attack. This episode follows her interaction with one peculiar titan and serves as the secret motivation for several of the series’ other characters. Where to Get It: The Attack on Titan manga Volume 12 Special Edition. Read our reviews of the series here and here. Episode Title: "There's No Choice But To Wish Them Happiness Right Here As They Arrive At Their Destiny"
Where to Get It: The special edition of the My Teen Romantic Comedy SNAFU Vita game. What It’s About: This OVA serves as an epilogue to the entire series and shows what happened to all the characters of the series in their new lives. But even surrounded by a peaceful, normal life, Yuno can’t help but feel that something important is missing. Where to Get It: The special edition of the Future Diary Redial manga. Read our full review of this OVA here and of the full series here. Episode Titles: "Abandoned Fleet" and "Altar of a Rare Beauty"
What It’s About: There are actually two extra episodes of Gargantia that never aired on TV. The first follows our heroes as they come across an abandoned fleet of ships. The second episode, from the third Blu-ray, shows what happens to Ledo’s commander, Kugel, after the two were separated in the series’ first episode. Where to Get It: The first Blu-ray box set and third Blu-ray box set, respectively. Episode Titles: "Reverberation" and "Vacation"
What They're About: Taking place after the events of the series, the first of these extra episodes tells the story of a mysterious character in the school network and its ties to a game that’s the clear precursor to Brain Burst. The second episode is your standard “everyone goes to a hot spring” plot—but with a fun twist. Where to Get Them: The special editions of the PS3 games Accel World: Ginyoku no Kakusei and Accel World: Kasoku no Choten. Read our full review of these OVAs here and of the full series here. Episode Title: "I Am Not a Cat"
What It’s About: This episode takes place right where the final episode of the series leaves off and follows Staz and Fuyumi as they head to Demon Acropolis. However, their progress is impeded when they encounter a group of vampire hunters. Where to Get It: The special edition of the Blood Lad Volume 10 manga. TV Special: Simulcast on Crunchyroll. OVA Episode: Included in the fifth Blu-ray release. OVA Episode: Included in the seventh Blu-ray release. OVA Episode: Included in the Attack on Titan manga Volume 13 Special Edition. OVA Episode: Included in the NouCome light novel Volume 8 Special Edition. OVA Episode: Included in the Watamote manga Volume Seven Special Edition.